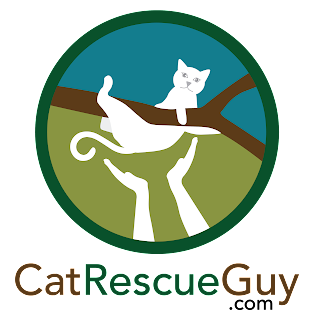 I don't know if it is the brutal heat that has caused the slump in the rescue business this summer, but I have not had a rescue to do in three weeks. 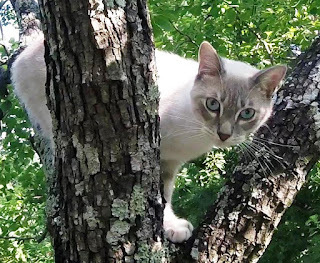 Maybe it's too hot for the cats to want to climb or for the dogs to chase them, but, whatever the reason, just when the weather strangely got a little cooler and drier, I got a call. 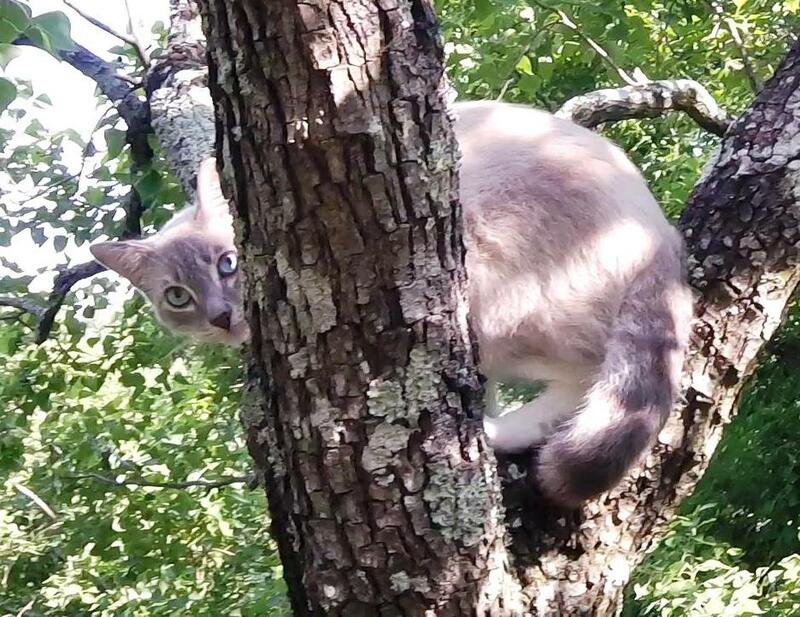 Rita called me to say that her indoor cat got stuck in a tree in her yard, and she has been unable to get him down. I told her I would be there first thing in the morning. 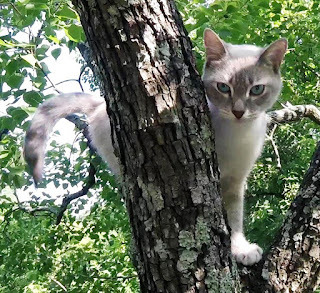 The next morning I went over there and found Rita's cat, Kane, about 25 feet high in a tallow tree at the fence line. (It seems like it's always a tallow tree and/or always on the fence line.) 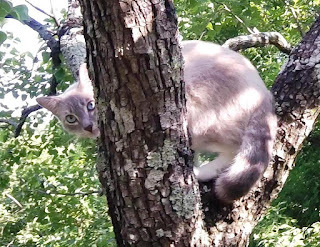 He was now actually a little higher than he had been just a few minutes earlier, and as I prepared to figure out how to climb up to him, he continued to climb a little higher still. Every time he moved, he messed up my plans for installing my rope. 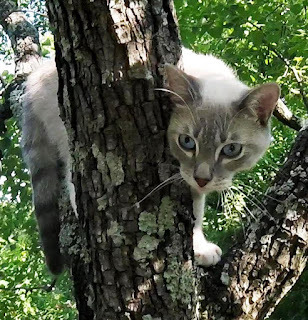 Fortunately, he eventually stayed still long enough for me to install my rope on the highest point in this tree that I dared, and he was not disturbed by that process. I climbed up to him slowly, talking to him along the way to make sure I did not surprise him. He watched me once I got close but seemed comfortable and not especially alarmed by my approach. I slowly climbed a little higher and he continued to remain calm and talk to me. Once I was close enough, I reached out my hand to him to sniff. 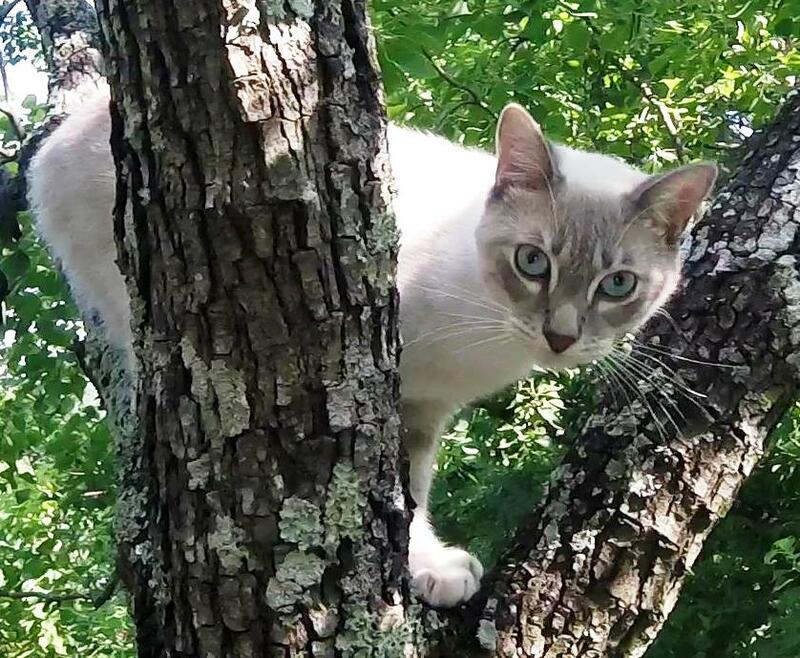 I also noticed for the first time that he is a Siamese mix with beautiful blue eyes and white feet. He sniffed my hand and let me touch him, and we easily made friends as I petted him. Yes, Kane is a sweet cat. I wanted to bring him down in the carrier, so I held the open carrier up to him. He peered inside and even placed one foot inside, but he did not go in. I pulled the carrier away and should have just opened up a can of food, but instead I was lazy and just gave him another chance to walk inside. This time, he seemed uncomfortable with it and began to walk away toward the end of his limb. I quickly pulled the carrier back and put it away. I don't know why he suddenly changed his mind, but I knew not to try that again. With the carrier out of the way, I had no trouble enticing Kane back to me. I prepared my cat bag on my right arm and visited with Kane a little bit while I did so. I petted him a little and felt his scruff. When the time was right, I grabbed his scruff and began to lift him off the branch. As expected, he grabbed the tree with his claws and held on. I gently pried his claws away from the tree and pulled the bag over his head, and Kane began complaining right away. I collected the opening of the bag in my left hand to close it off while I pulled my right hand out of the glove. I announced to Rita below that I had him in the bag when, suddenly, Kane's head popped up out of the bag. It turns out I did not have all the bag opening closed off after all. I quickly pushed his head back down into the bag and made sure to close the opening. That was close. He almost managed to claw his way out of the bag, and, if he had, he probably would have either jumped or fallen to the ground. Fortunately, he was now secured, and I brought him down safely. Rita took Kane inside and released him there. After realizing he was now home and safe, Kane settled in for a good feeding. Then he was ready for a little loving, a grooming session and a nice long nap in a soft bed.